– influencing nearly everything we do. You’ve likely heard that Uber is world’s largest taxi company, yet owns no vehicles. Facebook, the world’s most popular media owner, creates no content. Alibaba, the most valuable retailer, has no inventory. And Airbnb, the world’s largest accommodation provider, owns no real estate. But what you haven’t explicitly heard is that all of these companies are machine learning companies at their very core. 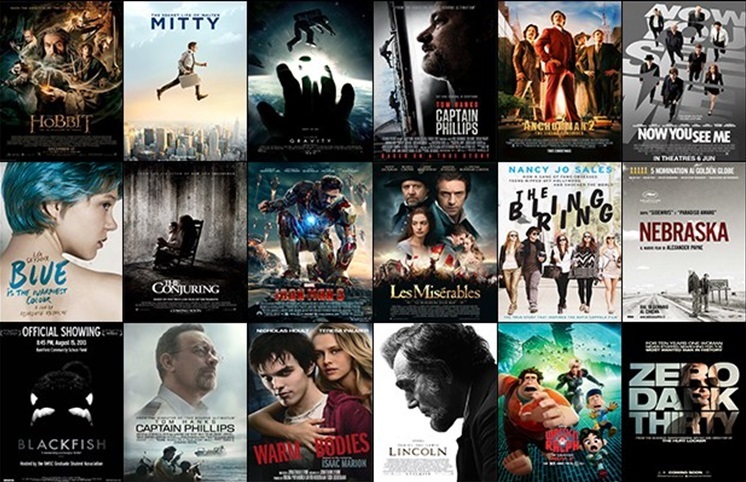 Companies like Netflix use machine learning to recommend movies for us to watch. Navigation apps like Waze use machine learning to help optimize our driving experience. 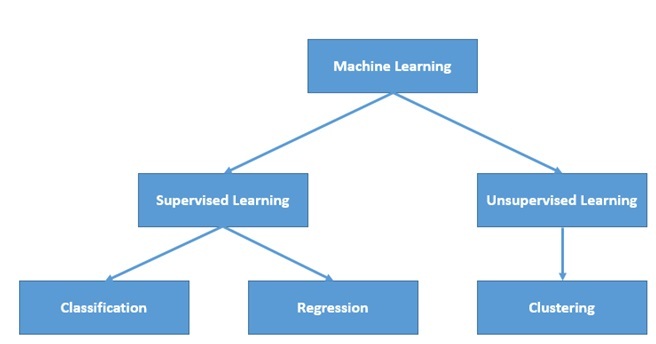 Machine learning is a type of artificial intelligence (AI) that provides computers with the ability to learn without being explicitly programmed. 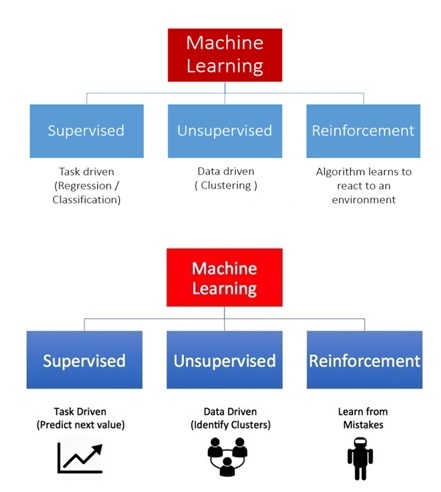 Machine learning focuses on the development of computer programs that can teach themselves to grow and change when exposed to new data. Machine learning always starts with data and our goal is to extract knowledge /insight from that data. We have a question and we hypothesize (to give a possible but not yet proved explanation for something) that our question might be answerable by the data. Machine learning needs some automation. We apply some process/algorithm to the data using a computer so that the computer can provide us the insight. Machine learning is not fully automated process. Machine learning requires us to make many smart decisions in order for the process to be successful. Machine learning is the idea that there are generic algorithms that can tell you something interesting about a set of data without you having to write any custom code specific to the problem. Instead of writing code, you feed data to the generic algorithm and it builds its own logic based on the data. Eg: For example, one kind of algorithm is a classification algorithm. It can put data into different groups. 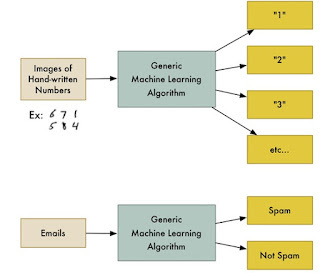 The same classification algorithm used to recognize handwritten numbers could also be used to classify emails into spam and not-spam without changing a line of code. It’s the same algorithm but it’s fed different training data so it comes up with different classification logic. · Image/Face/Smile Recognition Bike Number recognition and alarm at Signal Junction for the Traffic Police.o Face Recognition at Railway stations for a criminal with a known photo.o Face Recognition at a mass gathering for a known criminal with a known photo.o Open Google’s Mobile App, open camera, focus on a Shop/Business’s logo/name and get its reviews or more details from google servers. (more data it already has, more the accuracy would be). 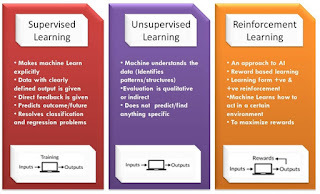 Supervised learning is also known as predictive modeling. It is the process of making future predictions using data. Here predictions are made on new data for which the label is unknown. Let’s say you are a real estate agent. Your business is growing, so you hire a bunch of new trainee agents to help you out. But there’s a problem — you can glance at a house and have a pretty good idea of what a house is worth, but your trainees don’t have your experience so they don’t know how to price their houses. This is called supervised learning. You knew how much each house sold for, so in other words, you knew the answer to the problem and could work backward from there to figure out the logic. Extracting structure from data or learning how to best represent data. 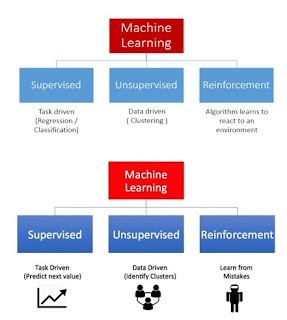 The most common unsupervised learning method is cluster analysis, which is used for exploratory data analysis to find hidden patterns or grouping in data. Here the baby is not yet taught about dogs and cats (data is not labeled). But still, the baby recognizes that they can be categorized into two groups – dogs group and cats group without labeling them like dogs and cats based on their looks and heights. Unsupervised learning is used against data that has no historical labels. The System is not told the “Right Answer”. The algorithm must figure out what is being shown. The goal is to explore the data and find some structure within. Another cool thing you could do is automatically identify any outlier houses that were way different than everything else. Maybe those outlier houses are giant mansions and you can focus your best salespeople on those areas because they have bigger commissions. 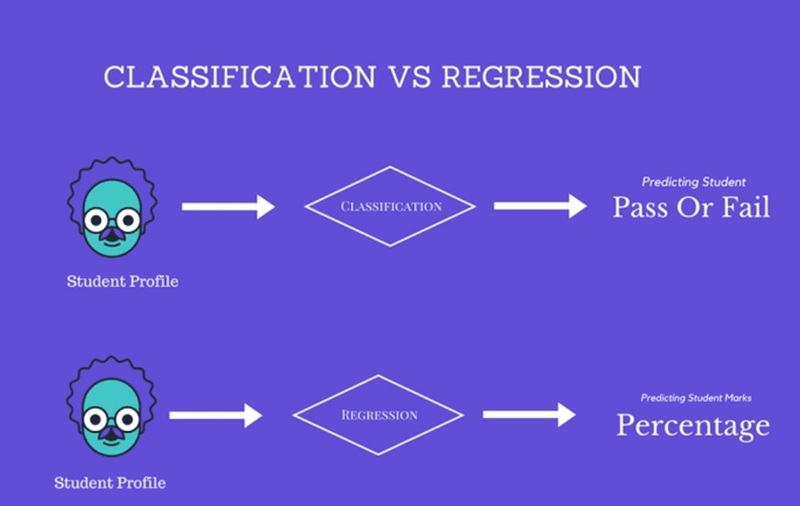 Classification, also known as categorization, is a machine learning technique that uses known data to determine how the new data should be classified into a set of existing categories. 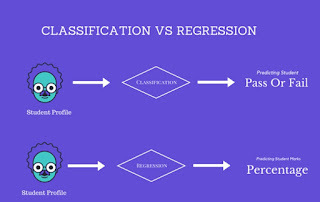 A classification is a form of supervised learning. Mail service providers such as Yahoo! and Gmail use this technique to decide whether a new mail should be classified as spam. The categorization algorithm trains itself by analyzing user habits of marking certain emails as spams. Based on that, the classifier decides whether a future mail should be deposited in your inbox or in the spams folder. iTunes application uses classification to prepare playlists. It is used to predict continuous values. Sachin has a house with W rooms, X bathrooms, Y square-footage and Z lot-size. Based on other houses in the area that have recently sold, how much (rupees) can he sell his house for? It can be some 'numerical value' (which can be continuous): this relates to regression. So we would use regression for this kind of problem. Suppose from your past data (trained data) you come to know that your best friend likes the above movies. 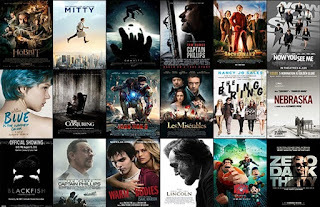 Now one new movie (test data) has released. Hopefully, you want to know your best friend like it or not. If you strongly confirmed about the chances of your friend like the move, you can take your friend to the movie this weekend. If you clearly observe the problem is about finding the count, sometimes we can say this as predicting the value. Clustering is used to form groups or clusters of similar data based on common characteristics. Clustering is a form of unsupervised learning. Search engines such as Google and Yahoo! use clustering techniques to group data with similar characteristics. Newsgroups use clustering techniques to group various articles based on related topics – technology, politics, sports etc. The recommendation is a popular technique that provides close recommendations based on user information such as previous purchases, clicks, and ratings. Amazon uses this technique to display a list of recommended items (“customers who bought this item also bought”) that you might be interested in, drawing information from your past actions. There are recommender engines that work behind Amazon to capture user behavior and recommend selected items based on your earlier actions. Facebook uses the recommended technique to identify and recommend the “people you may know list”. 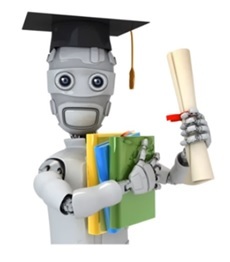 With Reinforcement Learning, the algorithm discovers through trial and error which actions yield the greatest rewards. Note: The Goal in Reinforcement learning is to learn the best policy.